Florida rooms come in one of two varieties. Both varieties offer a bright, sunshine filled space to sit, no matter the weather. The first type comes with walls encompassing almost nothing but windows, while the second type is screened in to allow the cool breezes to be felt. 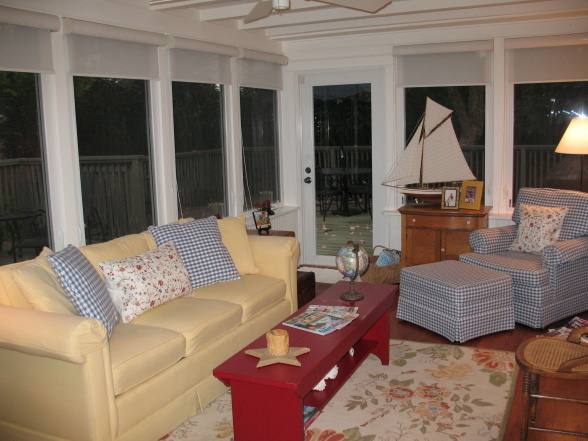 Screened in Florida Room’s tend to be done with a special kind of screen that has holes so small that ninety percent of bugs can not get through. These rooms tend to be a focal point in most homes, since they offer the wonders and benefits of both outdoors and indoors, together in a singular environment. All rooms can benefit aesthetically from the use of rugs, and a Florida Room is certainly no exception. There are special considerations you must make, however, when choosing the ideal rug for your sunny room. Please look below to see what these considerations are so that you may choose the best rug for your Florida Room. Durable– Durability should be a key consideration. Not only will the rug(s) in your Florida Room need to withstand a lot of foot traffic (whether it be of the two legged or four legged variety), but it must also be able to withstand a lot of direct sunlight. Direct sunlight can fade the color of any rug given enough time, but there are certain types of area rugs which will fade quicker. These are choices that you will want to avoid. Due to the heavy foot traffic, you will want a rug that will also be easy to clean. Bright– Since Florida Rooms are all about bright sunshine and experiencing the beauty of nature without dealing with the harshest of elements, the color theme you choose should be something bright and fun. Perhaps you could even choose to decorate your ‘Florida Room’ in a Florida theme. Rugs could be chosen with this in mind. Good examples would be something displaying: flamingos, beaches, Disney characters, palm trees, sunsets, sunrises, or even gorgeous swamp themes. If this doesn’t suit your tastes, any bright color is appropriate. Size– Size will be one of the most important things you consider. Do you wish to have an area rug, or a small rug or two to go in front of the entrance ways? How large an area does your rug need to cover? You will also want to think about what the idea behind your rug is. Is it simply a decorative piece to add personality and ambiance to your Florida Room, or will it be used for people to wipe their feet before entering into the main portion of the room? Thinking over these simple questions will help you to best assess the size of rug you will need.